Ask About Our Financing Options! Serving European Car Owners In The Surrounding Areas Of Apple Valley, Victorville, Hesperia & Barstow. DreamCars Auto Repair is a full-service European auto repair shop that services European vehicles. DreamCars offers everything in the way of service from inspections and oil services to brake jobs, tune-ups, engine and transmission work. Our staff has over 40 years of experience working on European cars and we would love to help you fix or restore your car. Please give us a call or stop by for an appointment. DreamCars specializes in European vehicles such as Mercedes, BMW, Jaguar, Porsche, Mini Cooper, Audi, Volkswagen, Fiat and many more. For all services performed, DreamCars Auto Repair uses only original equipment, recommended by factory for each specific vehicle. We provide service, parts and accessories for BMW, Mercedes, Porsche, Jaguar, Audi, Volkswagen and Mini Cooper. We are full-service, providing providing tune-ups, repairs, and mileage interval services all right here in the High Desert. 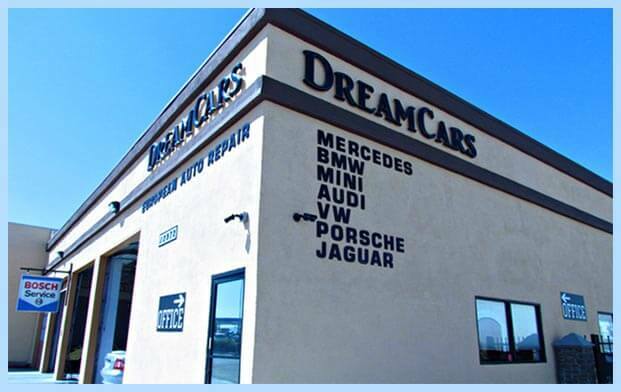 At DreamCars we only use OEM (original equipment) parts for repairs to your vehicle. If you are a do-it-yourself mechanic, we would be happy to order the right parts for you. We also offer high-performance products & modifications for the enthusiast in you! Give us a call today to talk about the parts and services your European car needs. Electrical System Services and much more! Our team of professional and highly skilled mechanics are capable of providing any service or repair necessary while saving you both time and money. Give us a call today to schedule a service appointment. At DreamCars European Auto Repair, we provide dealership-level service and repairs for all European vehicles. Our mechanics are highly skilled at performing quality repairs in a timely manner to get your performance vehicle back on the road. We make sure that we only use genuine manufacturer replacement parts and provide certified technicians that specialize in models from Audi, BMW, Fiat, Jaguar, Mercedes, MINI, Porsche, & Volkswagen. We also offer a vast array of factory services and repairs for your European car. We do everything from oil services and diagnostic testing to major engine and transmission repairs. We understand that all vehicles need proper maintenance and timely checkups to make sure that they continue working properly in the demanding area of the High Desert, and with the latest technology available our professional technicians will make sure that your car is in safe hands and reliable year-round. Copyright © 2018 Dream Cars Auto Repair. All Rights Reserved.